Refrigerant Supply Inc. actively purchases your refrigerants, as well as selling refrigerants to its customers. As CFC's are illegal to manufacture or import into the United States, our purchase, of your CFC's, is just as important as our CFC sales. Refrigeration Supply maintains a minimal inventory of refrigerant. Refrigerant Supply usually has your refrigerant sold, prior to receiving it from you. While Refrigerant Supply maintains a minimal inventory, we have immediate access to unlimited volumes of refrigerant. Our policy of minimal inventory, drastically cuts our operating costs. In turn this drastically cuts our refrigerant pricing for clients purchasing material from us, as well as allowing us to offer much higher purchase prices for refrigerant. 1. Virgin Refrigerant - To qualify as virgin refrigerant, the material must be packaged in its original containers and still have its original factory seals. While not required, it is desirable that 30 and 50 pound cylinders be packaged in their original boxes. 2. Reclaimed Refrigerant - To qualify as reclaimed, the refrigerant must meet ARI reclamation standards. To view ARI standards, go to our Reclaiming & Reclamation page. Most refrigerant reclaiming facilities will provide a certificate and put a reclaim seals on the containers to verify their purity. If you possess refrigerant that has been removed from a chiller system, it is highly unlikely that your refrigerant will meet these analytical parameters. Should you still feel your material may pass this criteria, you can have your refrigerant tested by ISI (Integral Sciences Inc.). You will find contact information for ISI on our Refrigerant Links Page. 3. Dirty Refrigerant - This is the category you should count on when refrigerants are removed from service. In this scenario, the material contains contamination of air, water, oil and particulates. This refrigerant is still a marketable commodity, yet will require shipment to a reclamation facility for processing. 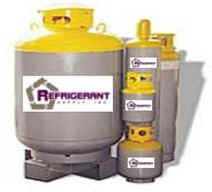 Refrigeration Supply can coordinate this processing activity for you, or we can simply purchase your refrigerant as is. 4. Mixed Refrigerant - This category indicates that your refrigerant is not just contaminated with air, oil, water, and particulates, but rather also contains contamination from other refrigerants or solvents. This material will require extensive processing to make your refrigerant a marketable commodity. In this circumstance, your product may, or may not, be economically feasible to be reclaimed. Refrigerant Supply specializes in the buying and selling of CFC's. We also market some of the higher priced HFC's and HCFC's. Because R-22 and R-134a are so widely available, at such low prices, Refrigerant Supply has found that it can only be competitive in this market when dealing with whole skid quantities. Should you be purchasing refrigerant for any other reason than resale, Refrigeration Supply will need verification or your certification to manage refrigerants. Refrigerant Supply Inc provides this information in its website as a free value to anyone who cares about environmental or chemical issues. The sources of this information could not be validated. This site is a compilation of information meant for casual reference only. Refrigerant Supply Inc. assumes no liability whatsoever for the accuracy or use of the information offered. It is hoped that this resource provides users with a heightened interest in such matters, stimulating independent research and review. Any matters which need professional attention may be brought to our attention via Email.